The original Spanish version of "Bailando" served as the theme song of the soap opera Reina de Corazones which aired on Telemundo. According to the IFPI, Bailando was the tenth best-selling song of 2014 with sales of 8 million copies worldwide. In an interview Iglesias gave to Univision Musica, backstage at the Premios lo Nuestro he told the reporter that when Bueno presented the song to him, he initially did not like it and did not want to record it. But after recording he loved the song. He termed it as one of his favourites from the album. The Peruvian singer and composer Sergio Pelo D'ambrosio Robles reported that the theme "Bailando" (signed by the Cuban Descemer Bueno) by Enrique Iglesias, copied the intro and the chorus of his song "Lejos de ti". A few months later, however, the Peruvian singer decided to withdraw the complaint because experts indicated that there was no plagiarism in the lyrics nor in the chorus. Accompanying music videos for both, the Spanish and the Spanglish versions of "Bailando" were filmed in Santo Domingo, Dominican Republic. The video for Spanish version was premiered through Univision on 10 April 2014 and was premiered worldwide on 11 April 2014 through Iglesias' official Vevo account for the Spanglish version through Vevo on 13 June 2014, next the Brazil Portuguese version with Brazilian singer Luan Santana through Vevo on 7 July 2014, and the Portugal Portuguese version with Portugal singer Mickael Carreira on 22 August 2014 through Iglesias' official Vevo account too. 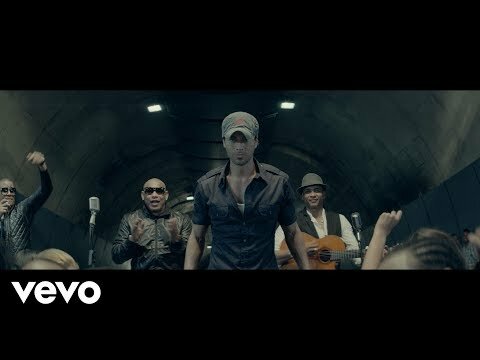 The music video is directed by Cuban producer Alejandro Perez, under Enrique Iglesias' longtime collaborators creative director Yasha Malekzad & executive producer Kasra Pezeshki. The music video was produced by Artist Preserve, London. The featured dancers are from Havana's Ballet Lizt Alfonso. The lead girl in the video is Ana Karla Suarez. The video production in the Dominican Republic was produced by Aquiles Jimenez. The Spanish version of the video has been viewed over 1.71 billion times while the English version of the video has received 200 million views as of November 2016. It is his most viewed video on YouTube, surpassing his 2010 hit "I Like It". The Spanish version of the video was the second most viewed music video on YouTube in 4 December 2014 behind Dark Horse by Katy Perry, and tenth overall in YouTube history. "Bailando" became the first Spanish-language music video to have been viewed over a billion times.